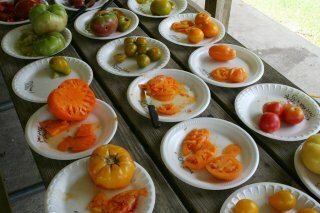 The 4th annual South East Texas Tomato Festival (SETTFest) was our third visit to picturesque Washington on the Brazos state park. Despite the unrelenting heat, it’s still a great venue to hold this event. This year, the date (June 19th, 2010) coincided very nearly with Father’s Day. We’re very thankful to any families that had to do without tomato-loving dads for a few hours. As always, we caught up with old friends, and saw folks who traveled from far and wide. We had visitors from San Antonio, Houston, Austin, Dallas, Louisiana, El Paso, TX (a 680 mile drive), and the furthest travelers were from California and Oregon! We are thrilled that more and more folks are bringing tomatoes and other items as well. This year, we saw a marked increase in the number of growers bringing tomatoes. An event like this works best when there are several providers of tomatoes. There was also a nice spread of cheeses, breads, and an ever-evolving pasta salad put together from fresh tomatoes and cucumbers from the event. View photos of the 2010 SETTFest!